The Bulk Feeder Loader™ is a versatile, hydraulic or electric operated feed loading system designed to lift and off-load bulk feed bags up over a low profile collection hopper that concentrates product onto an adjustable high-speed conveyor. Ideally suited for moving product from a floating feed storage shed out to boat-mounted feeders. Designed for single operator control, the Bulk Feed Loader™ requires command of three lever controls to lift and load one tonne (2,200 lb) bulk bags at a high transfer rate of twelve (12) tonnes per hour. Adjustments to feed conveyor height and operating speed ensure the Bulk Feed Loader™ is capable of loading any size feed storage hopper or vessel positioned AeroSpreader™ model feed broadcaster. No matter what the elevation or operating speed selected the feed conveyor operation is gentle on feed to ensure best-feed pellet integrity and minimum feed breakage when feed broadcasting. This careful attention to feed handling assists in maintaining best-feed conversion rates. Marine aluminum, galvanized steel and stainless steel construction with all hydraulic hose valve fittings wrapped in anti-corrosion tape and hydraulic cylinder rods chrome-plated. Conveyor fitted with a complete set of removable safety covers and a head box to smoothly guide the feed pellets into the receiving hopper. Immediate site setup with hydraulic power pack hose connections. Conveyor hydraulically lifts adjusted to any angle up to a maximum discharge head height of nine feet above ground level. 20 foot hydraulic hoses and a stand alone and movable Hydraulic Control Pedestal mounted on non-slip rubber feet allows for safe line-of-site positioning. Load feed hoppers and feed broadcasters without the use of a forklift with its limited reach over water. In addition to hydraulic speed control of conveyor, simple sprocket change to meet feed delivery rate requirements. Retain best feed pellet integrity – ensuring all feed consumed by fish or shrimp. Bulk bag hydraulic lift arm cylinders are metered to lift and drop at a measured rate controlling the movement for safety considerations. Savings on expensive forklift purchase, fuel, training and maintenance costs. The standard length of the conveyor is 14.5 ft (4.5 m) from center to center of the drum rollers. 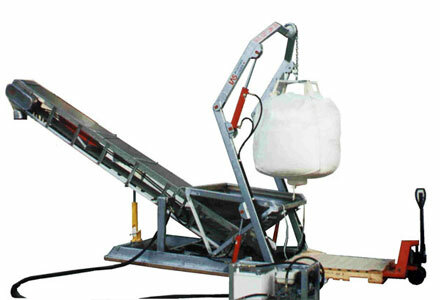 Conveyor reaches 244 cm (8 ft) forward of the frame rails, with a standard 4.5 m (15 ft) conveyor length. Other lengths available. Hydraulic Power Pack Drive driven by a Honda 6.5 HP GX200, with a directly coupled gear pump supplied by a 34 litre (7.5 gallon) hydraulic oil tank c/w filer. Frame, base, and oil tank are fabricated in marine grade aluminum. Honda gas motor is fitted with low oil alert.